Many NRM officials are beginning to feel the heat from President Museveni’s ferocious demand for accountability for all election campaign funds. Insider sources said President Museveni has issued an April ultimatum for all party officials to account for billions of shillings in campaign funds. 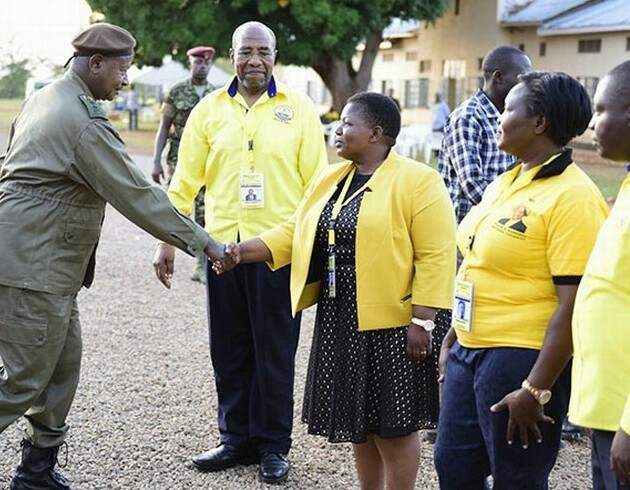 Insider sources say the president handed down the ultimatum at the conclusion of the 10-day retreat for newly-elected NRM MPs at the National Leadership Institute (NALI) Kyankwanzi, over the weekend. “As of now we don’t know how much was spent until the planned meeting after Easter when they [party leaders] will come with a comprehensive report and accountability,” an MP who declined to be named said. Various sources at the retreat said while Museveni did not mention any names, he described such officials as “thieves who can no longer be trusted with anything” because at every station they are placed and tested, they steal, including stealing from their own party. Some party officials interviewed declined to delve into how much the party spent on Museveni’s 5th term re-election campaign, but a report by an NGO; the Alliance for Campaign Finance Monitoring (ACFIM) put Museveni’s expenditure for the months of November and December at Shs 27bn. A source familiar with the inner workings of Museveni’s re-election campaign teams estimated that he spent at least Shs 1 billion a day on campaign- related activities. For the 90 days of the campaign, this would mean he spent at least Shs 90 billion. A big chunk of this money, according to Dr Kenneth Omona, NRM’s deputy national treasurer, was not handled by the NRM secretariat but by other parallel groups that were set up to mobilize for Museveni. “During the campaigns, there were many parallel teams each [with its own] budget. We [NRM secretariat] can only account for money that came through the secretariat,” Omona told The Observer on Tuesday. Though Omona declined to disclose how much was given to the secretariat, a source said, the secretariat was given about Shs 80bn to cover the entire campaign period but it was spent within a month. Omona said the secretariat officials who handled campaign funds have been given a time limit within which to account for the money they were given. “We are collecting reports from all officers who were delegated to handle the money, and all those who misappropriated it will be held accountable,” Omona said. He also said he was not aware that there were some party officials who diverted the money to private use. Rattled by their spending habits, Museveni is understood to have personally taken charge of the campaign expenditure in December. He also assigned intelligence officers to investigate the party officials alleged to have touched this money. The unofficial investigation, according our sources, revealed that some officials had siphoned off some of this money and invested it in property. We have been told that Museveni first got to know of the rampant theft of party funds when he gave one of his assistants Shs 500m and later sent an elderly woman to pick Shs 300m from the assistant. Not knowing that the elderly woman was being used as bait, the assistant gave her Shs 100m but in the official’s accountability to Museveni, he indicated he had given her Shs 300m. On the campaign trail, different service providers had threatened to go on a sit-down strike after months of non-payment. For instance, as the Museveni campaign approached Buganda, a firm contracted to entertain people threatened to withdraw its services until it was paid an outstanding bill totaling to hundreds of millions of shillings. The president intervened and the firm was sorted. Some musicians had also threatened to withdraw from the trail after the party failed to pay their accumulated bills. We understand that each musician earned Shs 2m per campaign rally which would add up to Shs 4m a day save for the likes of Bebe Cool and Chameleone who were bagging Shs 4m per rally. In its budget, NRM planned to give each village Shs 500,000. Shs 250,000 was given during the party primaries (in September 2015) and the balance was remitted a few days to the February 18, election day. Each of its 425 candidates for the direct parliamentary seats was entitled to Shs 25m while candidates for the district woman MP seats were each entitled to Shs 30m, the same amount meant for candidates for district chairpersons. According to the deputy NRM spokesperson, Ofwono Opondo, some of the flag bearers down to the LC-III level have not yet received their money. “There is a general widespread complaint against some NRM people who received the money to pass it on to the intended recipients but they [officials] became dodgy with [the money] and diverted it to their private use,” Opondo said on Tuesday. “Some villages have never received their share and that is why the first lady [Janet Museveni] said at Ngoma [government stock farm] that we [NRM] must have a known budget and must account,” Opondo added.